References Halftone::param_angle, Halftone::param_origin, Halftone::param_size, Halftone::param_type, SET_INTERPOLATION_DEFAULTS, SET_STATIC_DEFAULTS, TYPE_SYMMETRIC, and zero(). References HALFTONE2_IMPORT_VALUE, IMPORT_VALUE, Halftone::param_angle, Halftone::param_origin, Halftone::param_size, and Halftone::param_type. References EXPORT_NAME, EXPORT_VALUE, EXPORT_VERSION, HALFTONE2_EXPORT_VALUE, Halftone::param_angle, Halftone::param_origin, Halftone::param_size, and Halftone::param_type. 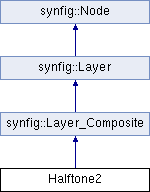 References std::abs(), synfig::Context::accelerated_render(), synfig::ProgressCallback::amount_complete(), synfig::ValueBase::get(), synfig::Layer_Composite::get_amount(), synfig::Layer_Composite::get_blend_method(), synfig::RendDesc::get_ph(), synfig::RendDesc::get_pw(), synfig::RendDesc::get_tl(), synfig::Layer_Composite::is_solid_color(), Halftone::param_size, and RENDER_TRANSFORMED_IF_NEED. References std::abs(), synfig::Context::accelerated_cairorender(), synfig::ProgressCallback::amount_complete(), cairo_renddesc_untransform(), synfig::ProgressCallback::error(), synfig::ValueBase::get(), synfig::Layer_Composite::get_amount(), synfig::Layer_Composite::get_blend_method(), synfig::RendDesc::get_h(), synfig::RendDesc::get_ph(), synfig::RendDesc::get_pw(), synfig::RendDesc::get_tl(), synfig::RendDesc::get_w(), synfig::Layer_Composite::is_solid_color(), synfig::CairoSurface::map_cairo_image(), Halftone::param_size, and synfig::CairoSurface::unmap_cairo_image().